Back in July I blogged about Lesser Evil's delicious low calorie flavored popcorn, and a few of you wrote in and told me how much you like their all natural krinkle sticks. So, I decided to give them a try! I bought a box of the sour cream and onion flavor, admittedly a bit skeptical based on the picture of the krinkle sticks displayed on the box, but still hopeful given your recommendations. I was thrilled to find that the krinkle sticks are very low in calorie like their popcorn counterparts, coming in at only 110 calories per 1 cup serving (aka 2 weight watchers points), which is awesome! As for the taste -- they turned out pretty good. They remind me of a cross between a very crunchy well-seasoned french fry, and a baked chip, both foods that I really like. They can be a bit dry, and I've been seen dipping them in my low fat sour cream, which I think in combination makes them a really yummy snack! 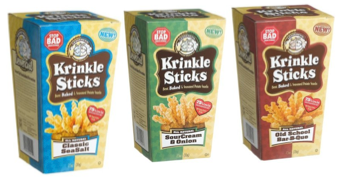 The krinkle sticks also come in a classic sea salt flavor (which I imagine is more french fry like) and a bar-b-q flavor as well. If you've tried them, I'd love to hear what you thought of them! The krinkle sticks are also gluten free and cholesterol free which is an added bonus to those of you that need to watch out for these ingredients. I buy them at Whole Foods, but they are also available at many other stores, which you can locate by using the company's store finder. I also made them available at the Yummy Diet Food Amazon store just in case you can't find a store that carries them near you. By the way, Lesser Evil's motto is "stop bad snacking" which I like! While these krinkle sticks (and their flavored popcorn) definitely aren't as good for you as fruits and vegetables, a raw food bar, or a small portion of nuts, they are a step above a lot of the fried and artificial snacks that are out there. ahh Yes, the good ol' krinkle sticks! I do love those things. I haven't tried all the flavors, but of course I'm partial to anything BBQ. :D Never dipped them in anything though! I normally just eat them as a side snack to a sandwich.